Jules’s Blurb: You’re going to learn how to make Khwanjais own Special Fried rice with Pineapple; at home we just call it pineapple fried rice to avoid confusion because she does some other special fried rice dishes too. If you would like to try another of our Thai fried rice recipes try our Egg Fried Rice Recipe which is not just egg fried rice, it’s more like the special fried rice you get in a Chinese take-away. Next comes the pre-cooked rice (Jasmine preferred) and mix all together for a short while. The rice should not be too moist. Lastly add half the cashew nuts, stir once or twice and…… Done! 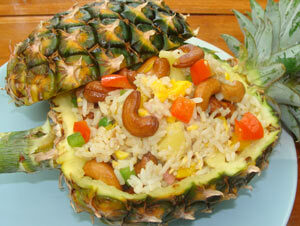 Serving this dish is a simple affair, made to look lavish by the use of the hollowed out Pineapple for serving. Simply spoon the Special Fried Rice into the shell and serve up on the table as per the photo above for a lovely centrepiece your guests will admire, you could also add a couple of jasmine flowers of an orchid for a final flourish. 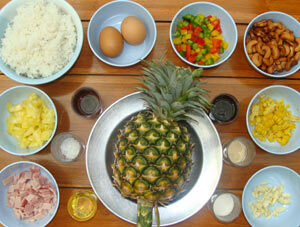 This dish can be quite happily eaten on its own and will also accompany virtually any other dish; Thai or otherwise. It can also be made spicy “on the plate” by the addition of a very special ingredient and it’s not what you might think, plus many more of Khwanjais top tips and suggestions for this recipe. Other ingredients to consider: Raisins, Apple, Celery, Carrot (quick boil first) or how about almonds instead of Cashews? Just use your imagination and think about colour, aroma and texture when choosing. If you make too much, you can keep in the fridge for a couple of days, including the pineapple shell then when you want to serve again, pop it in the microwave to reheat. Only do this once. Print the recipe because it’s a versatile dish and we give suggestions for changing ingredients. Interestingly Khwanjais’ sister came home shortly after filming and served herself some plain jasmine rice but served in the pineapple shell just for a hint of flavour. Yes we did have enough clean bowls!! There is one point in the video where Khwanjai ribs me about having even more teeth removed and my reply is to her is muffled, I mention this in case you worry that you were missing something important. I generally try to stay on top of translations. Please share this and feel free to leave your questions etc below..